Start by cutting an 8' 2x4 in half. Then trim 7" off of 2 of the 8' 2x4's. This will be the "bottom" of the frame. With a 7/8" drill bit, drill holes in the 2 8' 2x4's and 1 of the furring strips. (About 2-3" in from each end,and 2 more equidistant in between these. )Lay the 7'5" 2x4's flat on the ground, placing the 2- 4' boards against them on the ends. Then you can nail the 2 drilled 8' 2x4's on top of the 7'5" ones, overlapping the two end boards. Simply place your conduit "hoops" into the holes on the 8' 2x4's slipping the drilled furring strip to the "peak". (If you drill both furring strips,put them both at the peak, and you can then "open the top" for air circulation.) Fasten the hoops to the frame with nails or screws. I then cut 2 sheets of 6 mil plastic for each end. Fold plastic over and staple, using 3/4" strips of cardboard to reinforce and hold the staples. 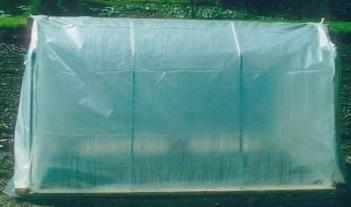 Then wrap 6 mil plastic around and "over the top" af the 8' sides. I leave one side not completely stapled, so it can be opened up on hot days. By drilling a few holes on the side of the conduit and anchoring bottom down with a furring strip, you can roll this side up and rest it on nails you have placed in the holes. If you put both furring strips on top, you can open it at the top like a ladies purse.Staple plastic with cardboard re-inforcement down well.